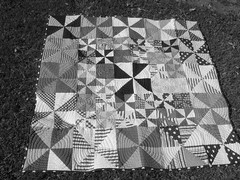 One baby quilt down many months later! This is one of the baby quilts for the twin boys. I am slowly chipping away on the hand sewing binding of the mate to this one. I am so excited to send these off in the mail very soon and hopefully the Mum with like them! Both quilts are based on Kaffe Fassett’s designs and color concepts. I really like how this one turned out and the quilting is stunning (not mine). Emi’s Patch in Eastwood does all my quilting for me. 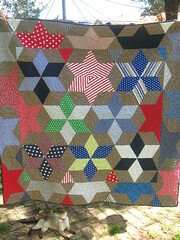 I would love to do the hand quilting, but time isn’t on my side and my wrist aches after too much hand sewing. Halloween is creeping up next month and I am so thrilled to see how many shops are embracing my favorite holiday! Rhys’ costume is sorted, but I have a few ideas floating around for Sloan’s costume. Normally I dress as something scary, but I thought I might do something different this year. We are heading away on a short break later this school term and I am hoping to sort a few small projects to take with me. I hope everyone survives school holidays. Sorry for the big break on posting. Too many projects and never enough time! Sloan is obsessed with Maisy Mouse and the gang. 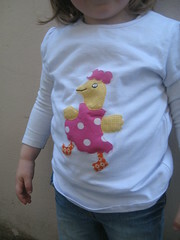 I have been dying to do a Tallulah shirt for her and here it is. She loves it! It is filthy and covered in strawberry juice now, but here it is in the first hour of wearing- clean! My computer has a faulty hard disc and is having a spa holiday to get fixed. I hope to have it back next week so until then, happy sewing and crafting all and will see you sometime when I am back online. We celebrated Rhys’ birthday party early this year last Saturday while it was bucketing rain. I am still recovering and will post some photos of the mayhem they created. We threw the party at the house we are going to bulldoze in a few weeks and let them paint the walls, floors, ceilings and each other. The boys went crazy! Primal is a good way to describe it. The last two years I have made special t-shirts for the celebrations. 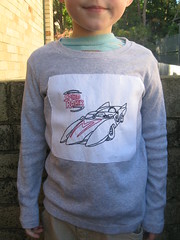 This year he is obsessed with Speed Racer. I couldn’t find any Speed Racer fabric so I traced this design and embroidered it. It took about four nights to do and we put a number 5 on the back. He loves it and can’t get enough wear out of it. I love that he indulges my sewing fetish. There are some more photos on Flickr. Okay, feeling a bit less burdened with school sewing now that this is finished. Rushing it up to the school this morning for the auction tonight. Whew! 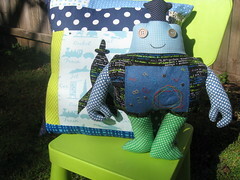 I had grandiose plans to sew another doll and pillow for the school auction, but I now have a head cold. It is ridiculous how bad our health has been this winter. Mark has just whipped Sloan down to a late night doctor with a suspect eye. Those first days of Spring were a tease, but hopefully they will be back very soon! 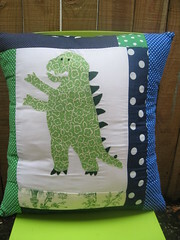 I have the start of a dinosaur pillow. Let’s see if I can pull it together tonight. The rocket is something I made up on my own and the robot is one of Hilary’s Wee Wonderful patterns. I love the robot. I left the pocket open in case someone wants to use it as a tooth fairy pillow. Force be with me sewing tonight!